The PERFECT holiday family photos, just in time for Christmas! 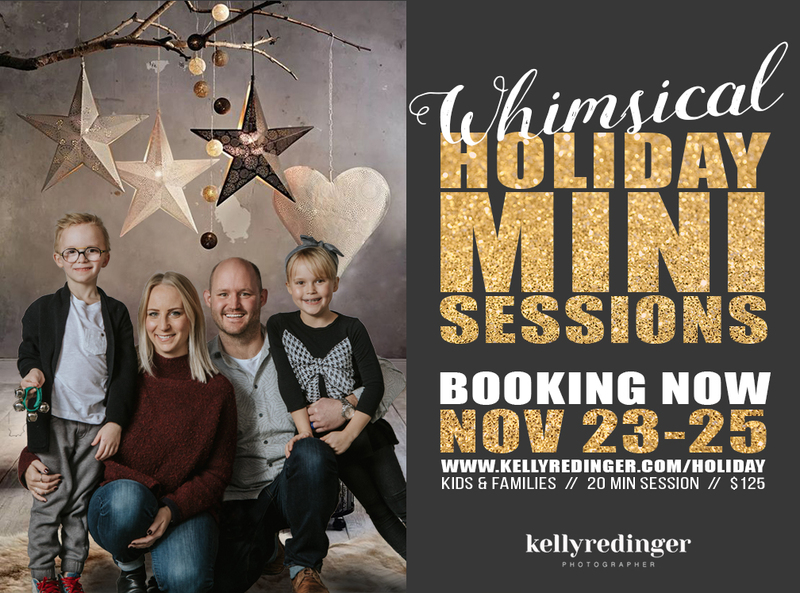 This mini session is 20 minutes in length, giving you just enough time to capture your family in a whimsical holiday setting. Great for capturing your family, or for individual or sibling photos of the kids. This year’s theme is Whimsical. Abstract background, aged wooden floor, faux fur, pillows and hanging stars and decorations all come together in a warm and cozy studio setting for your photos. The set comfortably fits your family up to 6 people. We could squeeze in one or two more people if we needed to (especially if they are children), but for best results you should keep the numbers down to 6 or less. Session fee is $125 (+gst), due at time of booking. This is the session fee only – digital files sold separately. Studio is located in North East Edmonton. These images are great keepsakes, and you will have the digital files delivered to you in time to print and include with your Christmas cards. Not to worry – I’ll send out a clothing guide to help you choose! Overall, the set will have a warm and cozy feel, with a lot of grey, gold, brown and ivory tones. You can choose to wear shoes, or go without (socks, or bare foot). Make it casual if you like, holiday PJ’s, or dress it up. Just be warned – I may have you sitting on the ground so wear that something that you can sit or move around in. How many people can I include? The set is designed to fit your family perfectly. There is room for up to 6 people comfortably. It would be possible to squeeze one or two more in, though it’s not ideal. However, Multiple family groupings are discouraged due to time constraints. For example, you CAN ask for a full family photo, and then separate photos of just the kids. However, if you are bringing in larger groups with multiple groupings or arrangements, please consider booking an additional slot. Are any images included with the session fee? No, Santa will not be at these photo sessions. We talked, but he has a lot of things on the go this time of year, so he will not be in attendance. These mini-sessions will be for you and your family.